A micro switch, also known as snap-action switch, is a generic term used to refer to an electric switch that is actuated by very little physical force, through the use of a tipping-point mechanism. They are very common due to their low cost and durability, greater than 1 million cycles and up to 10 million cycles for heavy duty models. This durability is a natural consequence of the design. Internally a stiff metal strip must be bent to activate the switch. This produces a very distinctive clicking sound and a very crisp feel. When pressure is removed the metal strip springs back to its original state. 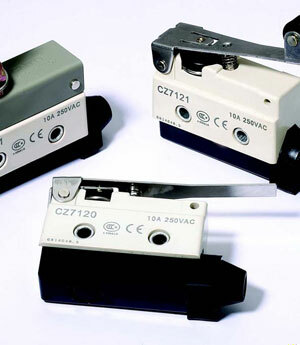 Common applications of micro switches include the door interlock on a microwave oven, levelling and safety switches in elevators, vending machines, and to detect paper jams or other faults in photocopiers. Micro switches are commonly used in tamper switches on gate valves on fire sprinkler systems and other water pipe systems, where it is necessary to know if a valve has been opened or shut. The defining feature of micro switches is that a relatively small movement at the actuator button produces a relative large movement at the electrical contacts, which occurs at high speed (regardless of the speed of actuation). Most successful designs also exhibit hysteresis, meaning that a small reversal of the actuator is insufficient to reverse the contacts; there must be a significant movement in the opposite direction. Both of these characteristics help to achieve a clean and reliable interruption to the switched circuit. 1. Inductive load has a power factor of 0.4 min. (AC) and a time constant of 7 msec.max.(DC). 2. Lamp load has an inrush current of 10 times the steady-state current,while motor load has an inrush current of 6 times the steady-state current. Operating frequency Mechanical: 120 operations/min.